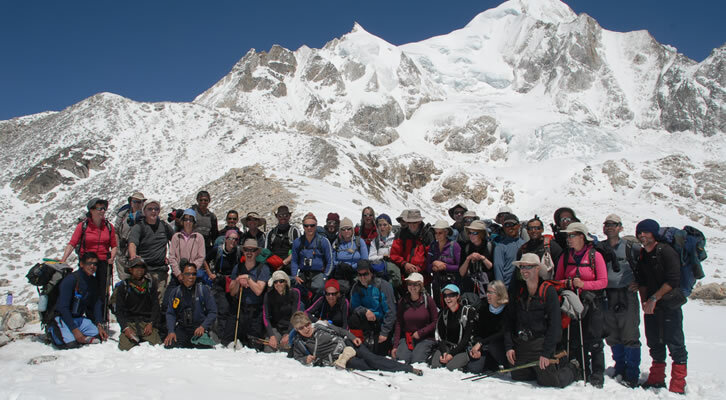 Karnali Excursions has organized its first ‘Around Manaslu Trek’ for the 2015 season, sending a group from America, here in Nepal to work with Habitat for Humanity, on a 19-day exploration of Nepal’s spectacular mountain sceneries, Himalayan culture and wildlife. They departed Kathmandu on October 22nd, 2015. This is the first ‘Around Manaslu Trek’ organized by Karnali Excursions since the devastating earthquake that shook Nepal on both April 25th and May 12th. The Manaslu region is considered safe for trekkers, as trekking trails have been well- maintained, and local trekking lodges are in full operation. The Manaslu trek is one of the finest and most spectacular trekking circuits in Nepal. This trek travels through contrasts of vegetation zones from agricultural terraces, to humid forests and up to the glaciated pass of the Larke La. The trek circumnavigates Manaslu, the world’s eighth highest mountain, and traverses the Upper Buri Gandaki River valley before crossing the pass at 5,213 meters and descending to the Marsyangdi valley. The trail is a contrasting trek in which the trekker gains altitude only to lose it again. Once you reach Lihi Gaon the valley broadens out, and as you head north, you aim for the landmark of the large monastery in Lho. Manaslu dominates the view to the northwest where soon Sama Gaon is reached, the base camp for all expeditions planning to summit Mt. Manaslu. The ancestors of those living in this region fled Tibet in the 1950s, and this, combined with Manaslu’s close proximity to the Tibetan Plateau, means that the local language and culture of the people living in this region is Tibetan. The trails and facilities in Manaslu have improved over the years, however, in some places heightened awareness must be maintained on the narrow, and at times exposed, paths. This trek is still a real adventure and a definite journey of a lifetime! We have schedule two departure dates in 2016 for Rara-Khaptad: March 13, and October 11. To learn more about this trip, please go to Around Manaslu Trek.